Happy belated Meat-Free Monday! The Opinioness has been swamped with work and socializing (which of course involves drinking wine!) so I’m a tad late in my recipe post. To make up for it, I have three recipes. Huzzah! As I’ve been mingling lately, I thought it would be fab to include a menu fit for a party. Vegetarians and vegans often worry what to serve when entertaining as it may be their friends or family members first foray into non-meat cuisine. I myself often agonize over what to prepare as I want my guests to be wowed. A bad dish may have non-vegans declaring that all vegan cuisine is lackluster. So I bring you these three delish finger foods. 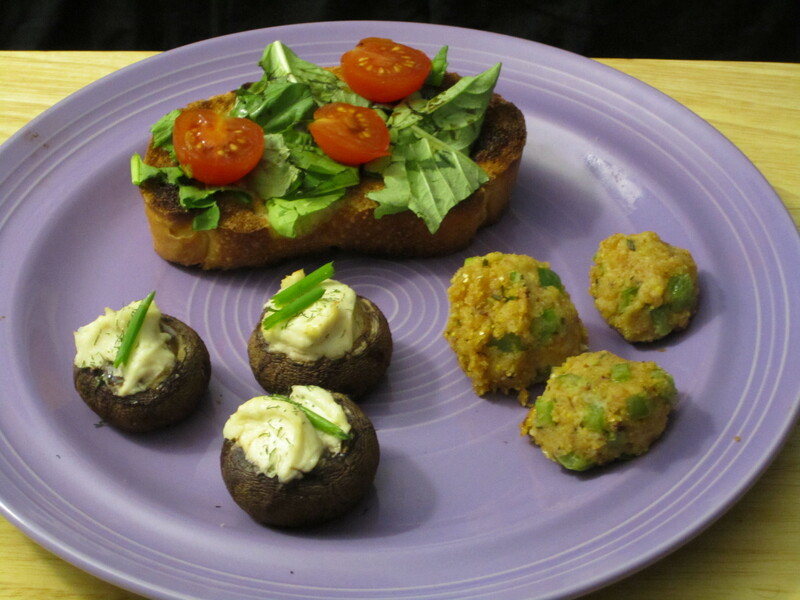 The Mushroom Poppers (which I’ve modified slightly) and the Tomato, Basil & Arugula Bruschetta come from my vegan culinary guru Colleen Patrick-Goudreau and her masterpiece, The Vegan Table. Quick and easy, these two appetizers comfort and satisfy. I served both at my Oscars party earlier this year and they were a smashing success. The freshness of the basil, arugula and tomatoes taste like summer on a plate. The creamy Mushroom Poppers are so yummy, be prepared to run out of these fast. My co-worker had requested some vegan soul food and I aim to please. So I thought I’d try the Black-Eyed Pea Fritters. The trickiest recipe of the three, these spicy and hearty bites come from eco-chef Bryant Terry‘s cookbook Vegan Soul Kitchen. While the “batter” is fairly easy to prepare, the fritters lose their shape easily in the oil when you fry them. Be sure that the coconut oil (which imparts a subtle sweetness) is not too hot or your fritters may come apart (and to avoid a smoke alarm scare, which happened to me at 2am. Yep, I stay up cooking until all hours of the night.). I hope these recipes will please your palate and be a hit at your next soiree! Click here for the recipe for Black-Eyed Pea Fritters. Preheat oven to 350 degrees F. Clean mushrooms, with paper towel and remove stems, being careful to scoop out a little pocket in the mushroom caps. In a small bowl, combine cream cheese, garlic powder, chives, salt and pepper. With a small spoon, fill each mushroom cap. Place mushrooms on a cookie sheet and bake for 15 minutes or until cream cheese starts to brown. Garnish each mushroom with a pinch of dill when done. Cut bread into 1/2-inch thick slices. If broiling in oven, brush olive oil onto each side and broil for 2 minutes on each side. If toasting in toaster oven, no need to oil. Once you remove bread from oven, rub whole peeled garlic clove onto each side. Place on platter and set aside. In a small bowl, combine tomatoes, arugula, 1/2 cup of basil, oil, vinegar and garlic powder. Coat greens with dressing. Spoon mixture onto each slice of bread. Add rest of basil on top and season with salt and pepper. Mmmmm, I remember those poppers, they were SO good! Dressing? I don’t see any dressing listed in the ingredients. So what kind of dressing do you like for this recipe? Sorry for the confusion there. The “dressing” is the mixture of olive oil, balsamic vinegar and garlic powder. Looking at the directions again, it would seem a bit redundant since I say to combine the greens, tomatoes and liquid ingredients in a small bowl anyways. Thanks for asking!